A bottom or lower step of a flight of stairs, with a quarter circular end. 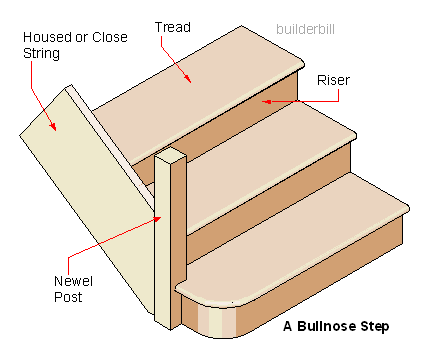 Like the previous round end step, the bullnose is mainly for show, it looks different, but it does add strength to the fixing of the newel post. It means that the newel is set back the width of a step and so in really tight spaces it gives a touch more clearance when swinging onto and off the stair with a turn.